"thanks for the trouble you took from her eyes, i thought it was there for good so i never tried"
Was the setlist for the 14th the same as for the 13th. Wondering what to anticipate for tomorrow, but of course everything will be wonderful. Yes, would somebody be kind enough to post the setlist for the second O2 show please? I just got back from London to Madrid. On the same day that September 13 but with a change ... CHELSEA HOTEL! 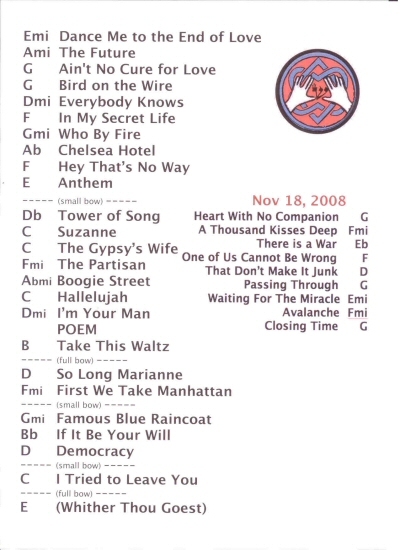 So, same setlist as Nov 13, but with Chelsea Hotel #2 as the second song in the second set (in between Tower of Song and Suzanne like he did in Rotterdam?)? Can someone please post Tuesday's RAH set list? RAH second concert had the exact same setlist as the night before. "Poem" is the reading of "Thousand Kisses" while the same title on the right refers to the song. There are many messages in several threads requesting other LC songs, but during the fall leg the band will play only songs listed above!! Passing Through would be a dream come true if he plays that in Manchester! No "Whither Thou Goest" tonight as we ran out of time, the show ended at 11.05pm. As Leonard said, it was a contractual thing! As the crew were singing "Whither Thou Goest" the Unified Hearts symbol slowly appeared on the back cloth ... like a blessing. Here the Paris setlist for Nov. 24.